As you can see, there’s a new column with statistics for the potential subdivisions. This gives us the ability to pick elements that stick out in some way. In this case it enables us to find individual items that generated enough revenue to justify their own product group. 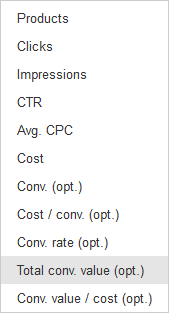 In the screenshot, the total conversion value of each article is displayed. There are a few other statistics that can be selected by clicking the button in the column header (the selection is displayed on the right). There are only ten metrics plus the number of products, but everything important is covered. There are still a few problems. One is that you’re limted to one column at a time. Another is that the date picker is grayed out when the subdivision menu is active so that you have to close the menu in order to change the date range. It’s not perfect yet, but I think this is a step in the right direction. I know that some people are in favor of rigorous segmentation, with a product group for each individual item. If you work like this, or have an automated solution that handles segmentation for you, then this new feature won’t make any difference. But if you have to segment things manually and have to keep things manageable, this helps a lot. So far, we’ve found this feature in only one account and I haven’t seen any mention of it anywhere else in the two weeks since our first find. This could indicate that Google is still working on it before rolling it out globally. While this positive development seems to be very exclusive, another change seems to be universal: You can no longer get search queries for shopping campaigns from the keywords tab. The only way to get them is through the dimensions tab. This is bad news since you could previously act on unwanted queries directly from the keywords tab. You were able to modify and add them as negatives to ad groups, campaigns, and lists easily. Now you have to do your analysis on the dimensions tab and act on it somewhere else. These developments seem to aim in opposite directions. With adding product groups, thanks to the new column the analysis on the dimensions tab would no longer be necessary. This saves us one step and makes the workflow much better. With adding negatives on the other hand we now have to go through dimensions. This means an extra step is added, making the workflow worse. It’s possible that Google made a mistake with the keywords tab. They’re currently in the middle of rolling out a small change and may not have thought this through for shopping campaigns. Maybe they’ll fix this once they realize they made a mistake. In general, I wish Google would increase their efforts to improve the workflow for shopping campaigns. This kind of advertising generates a substantial chuck of their revenue but they don’t seem to take improving the interface seriously. 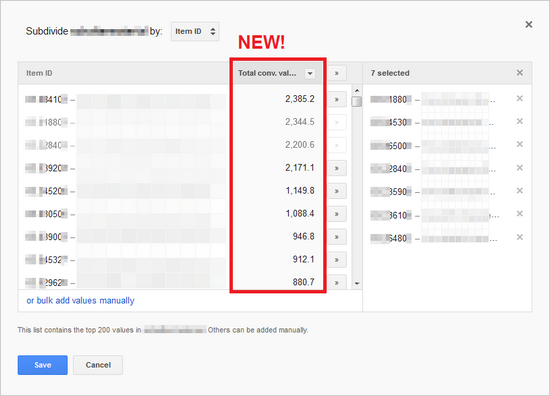 This is OK for some agencies that like to automate things anyway (hello) and it’s fantastic for tool vendors, but it’s not exactly great for people who have to rely on the AdWords interface. I believe it is Google’s intention to provide advertisers with the tools they need to use their system. However, looking at the 18 months since the global rollout of shopping campaigns it seems that Google has somehow forgotten about them. Let’s hope they get back on it. This entry was posted in Google Shopping, News by Martin Roettgerding. Bookmark the permalink.